A venus figure carved in mammoth ivory has been discovered at the East Gravettian Khotylevo 2 site by Dr Konstantin N. Gavrilov, from the Institute of Archaeology, RAS, Dm. Ulyanova 12, 117036, Moscow. 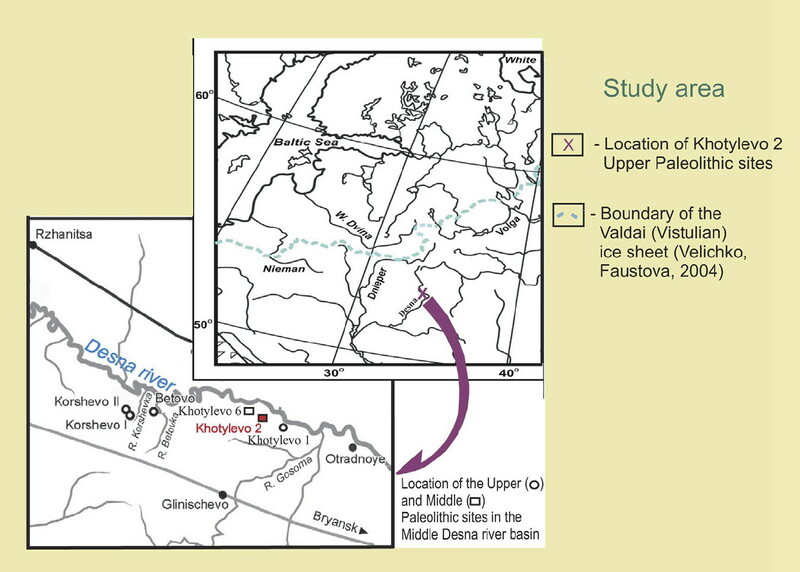 The Upper Paleolithic site of Khotylevo 2 is situated 400 km SSW of Moscow and 25 km NW of Bryansk. The site was discovered in 1968 by F.M. Zavernyaev. The recently discovered venus from Khotylevo 2. The venus shares some characteristics of venus figures much further east on the continent, from Kostienki, Gagarino, and Avdeevo, and is obviously from a similar culture. The venus is only five cm long. The position at the site where the venus from Khotylevo 2 was discovered. 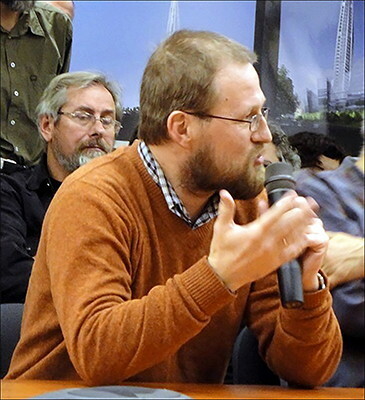 Dr Gavrilov is deputy head of Stone Age Archeology department of Archeology Institute, Moscow. 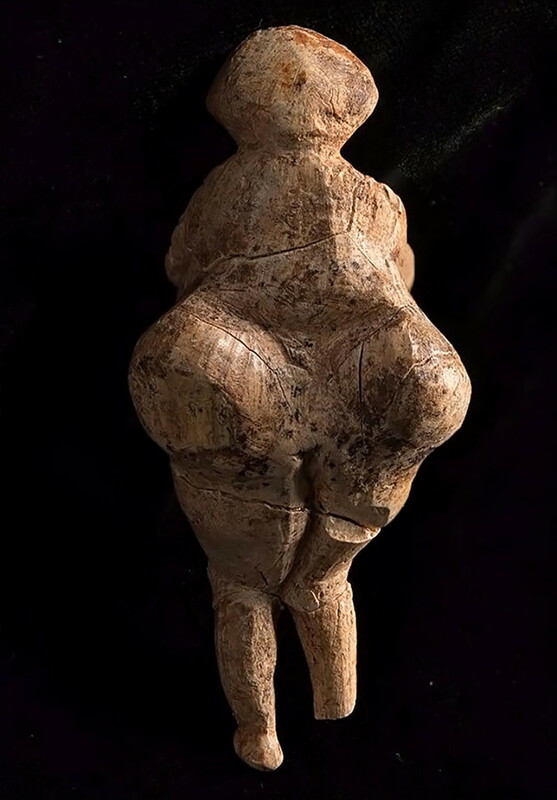 He says that the exceptionally rare Venus figurine is made from a mammoth tusk and it portrays a fat, perhaps pregnant woman, with a big belly and bust. Part of the bust and belly has peeled off along a natural crack in the tusk. 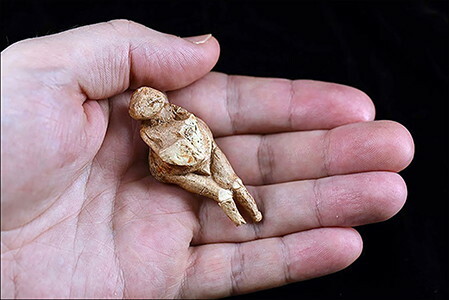 The figurine was found near large limestone layers and parts of mammoth bones that were coated with a mineral sienna (iron and manganese oxide) paint. 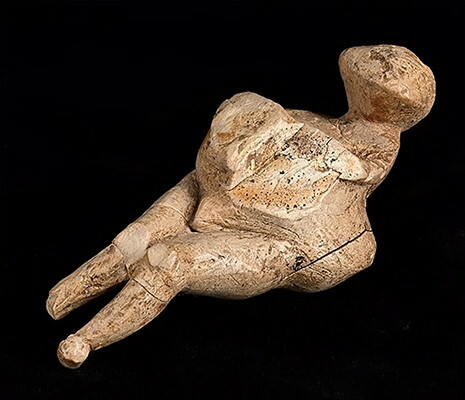 Most likely, the statuette was placed next to the bones on the ground rather than buried like other Venus figurines. Such prehistoric statuettes are ceremonial and ritual objects, Dr Gavrilov said. 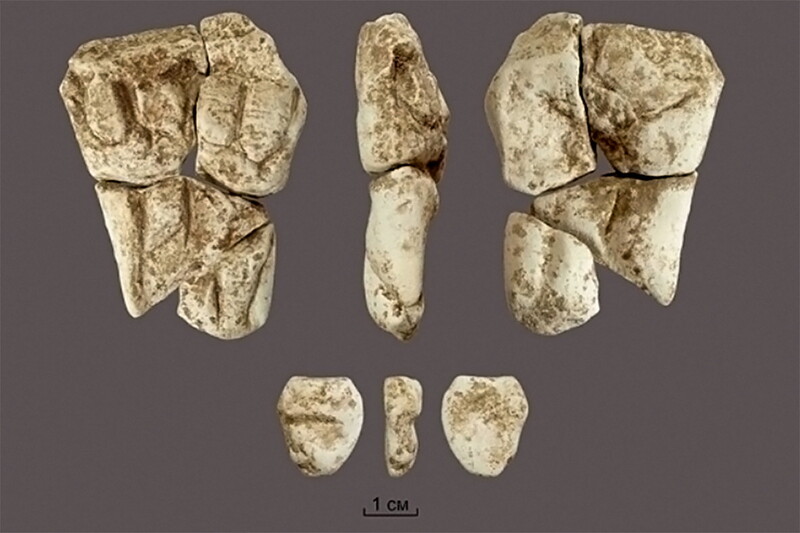 Similar examples have been found in Siberia, notably close to the Angara River near Lake Baikal, but the most recent analysis suggested these were - in fact - clothed, contrary to earlier examinations, and evidently unlike the new find from the Khotylyovo-2 site in Bryansk region. Archeologists have been exploring the site since 1993. Radiocarbon analysis suggests tribes of hunters and gatherers lived there 21 000 to 24 000 years ago. Scientists have found numerous bones of mammoths, bison, as well as many flint artefacts. 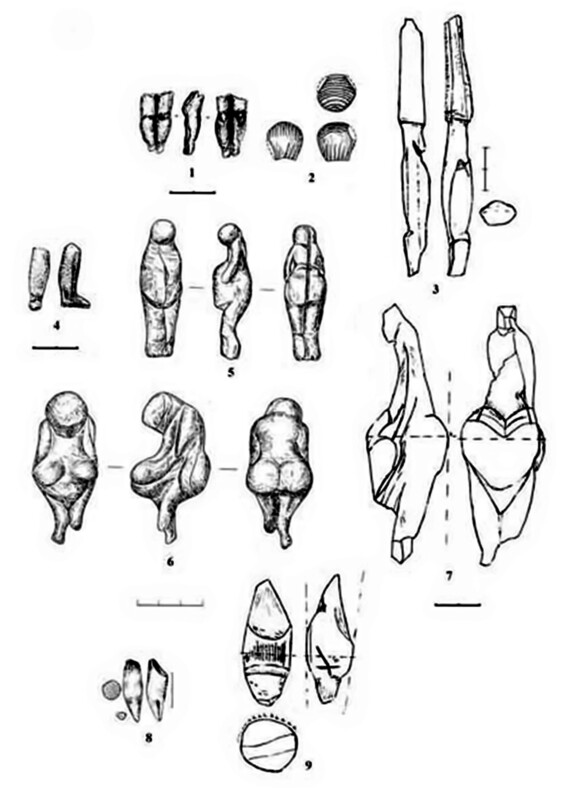 Other venus figures from the Khotylevo II site. Double female statuette and schematic figure carved out of chalk. 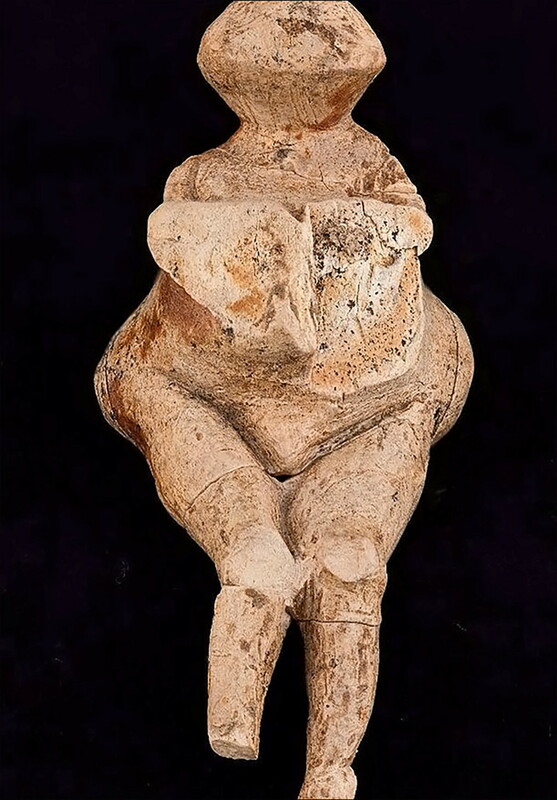 The double female figurine (N° 1) can be described as a flat sculpture. Its dimensions are 58.5 x 44.5 x 15mm. The two female figures are shown side by side on the front of the trapezium-shaped chalk slab. They were rendered in bas-relief, in a realistic manner, characteristic of the Eastern Gravettian. Breasts, abdomen and legs down to their ankles are carved while hands and heads are missing. The back surface of the statue, worn smooth, lacks realistic details. The lower half of the back side is divided into two parts by a broad vertical groove, corresponding to the image of the two female figures on the face of the statuette. The statuette was broken into four fragments, apparently of old. 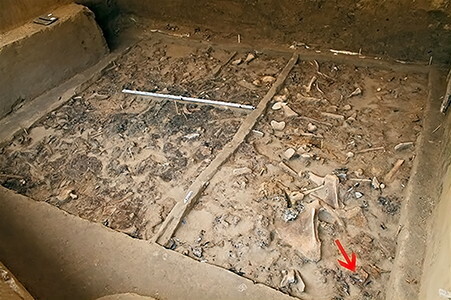 One of them is an image of two women with breasts and abdomen, the second –two fragments for the legs– represents the lower part of the legs. 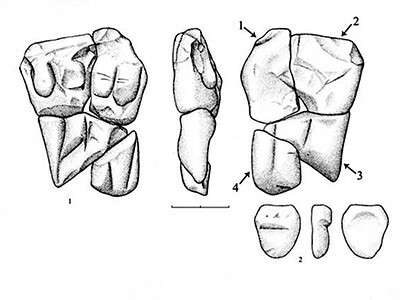 However, one of these fragments, namely the lower part (foot) of the right figures has not yet been found. The side surfaces are smoothed. 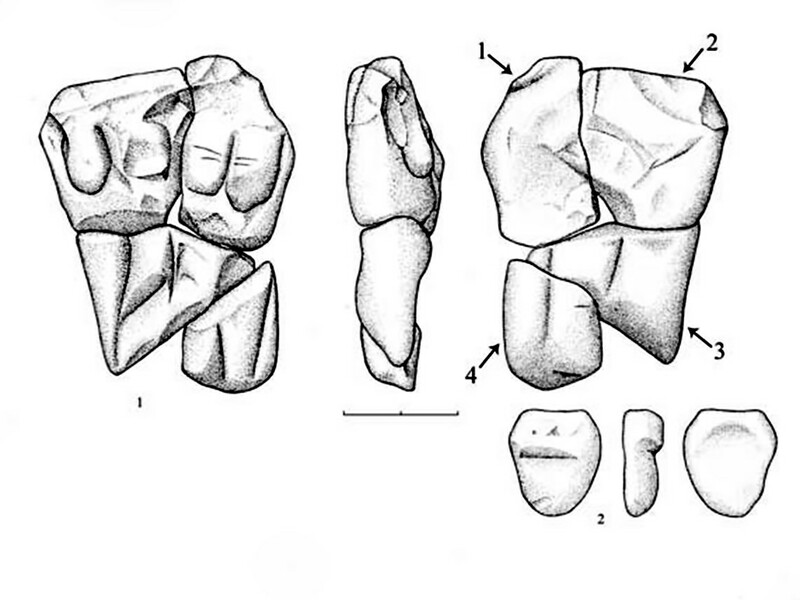 The top piece was divided into two parts after falling into the cultural layer as a result of natural post-deposition processes. Thus, the sculpture consists of four fragments. Figure N° 2 is 18 x 16 x 7/6mm. Both figurine and figure are close enough in their proportions, despite their difference in size. The second one is a flattened figure, also trapezium-shaped. One of its sides, perhaps its 'front', is divided by a horizontal groove into two parts. The other side, its 'back', is flat. So, the widest part of the figure, as with the statuette, would be its top. All the surfaces of the figure were smoothed. We interpret it as the schematic image of a woman. We assume that the front parts correspond to the breast (top), abdomen and legs (bottom). Gavrilov, K., 2012: New female figurines from the site Khotylevo 2, in: Clottes J. (dir. ), L’art pléistocène dans le monde / Pleistocene art of the world / Arte pleistoceno en el mundo, Actes du Congrès IFRAO, Tarascon-sur-Ariège, Septembre 2010, Symposium Art mobilier pléistocène, N° spécial de Préhistoire, Art et Sociétés, Bulletin de la Société Préhistorique Ariège-Pyrénées, LXV-LXVI, 2010-2011, CD: p. 1291-1297. Khlopatchev G., 2006: Les industries en ivoire du Paléolithique supérieur de l’Europe orientale, Saint-Pétersbourg: Nauka Publishing House, 262 p. (in Russian). Zavernyayev, F., 1978:The Anthropomorphic sculpture of the Upper Palaeolithic site of Khotylevo, Soviet Archaeology, 4. p. 145-161 (in Russian).